If you love travelling and photography as much as I do (who doesn’t), I’m sure you have come upon the dilemma of how much you can hike with. You want to travel light, so that your outing doesn’t become hard work, yet want to be prepared to bring your creativity to life. 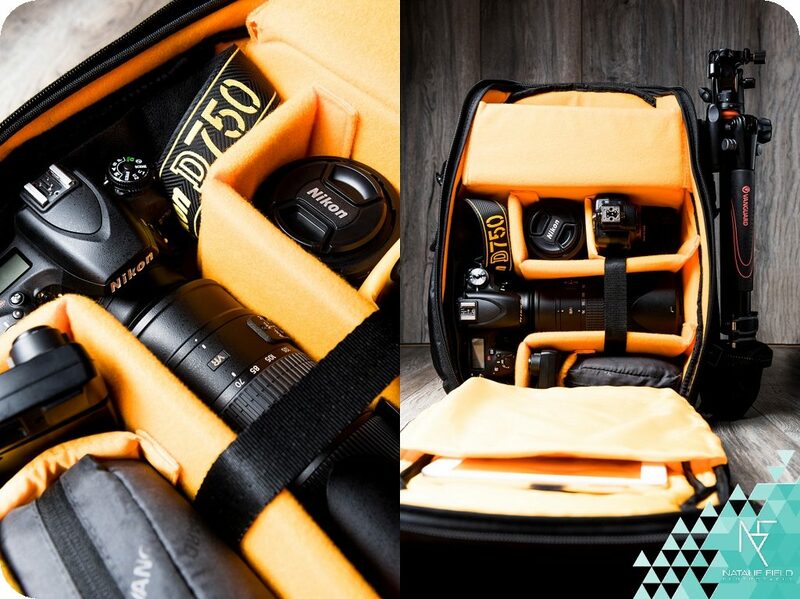 The Vanguard Alta Rise 45 might just be the bag for the occasion. Whether you are hiking landscapes or urbanscapes, the avid photographer will require a few tools to manipulate the scene to tell their story. At the very least, you will require a camera, 1-2 lenses, flash (speedlight will suffice), tripod, water and a snack. And if, like me, you are hoping to capture some conceptual portraiture, an outfit or two. I’ve tried several different solutions in the last couple of years. My first attempt was to simply remove items from my camera bag. 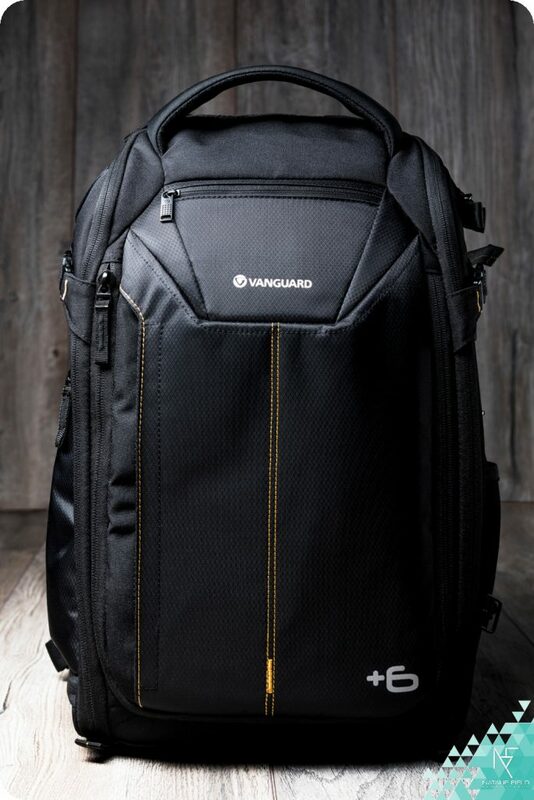 Because I shoot assignment work both in studio and on location, I have opted for the Vanguard Heralder 51T as my primary bag. This bag offers both backpack and trolley functionality, and although very practical for 90% of the work I do, it is not designed for a full day of traversing landscapes. My second inclination was towards to the Vanguard Veo 37 messenger bag, as it could double up as a solution for both event and travel photography. But alas, once packed it is somewhat hefty, and the positioning over the shoulder starts becoming uncomfortable after the first 5km. This too, would not suffice. Although I highly recommend both bags, there really is a bag for every occasion. 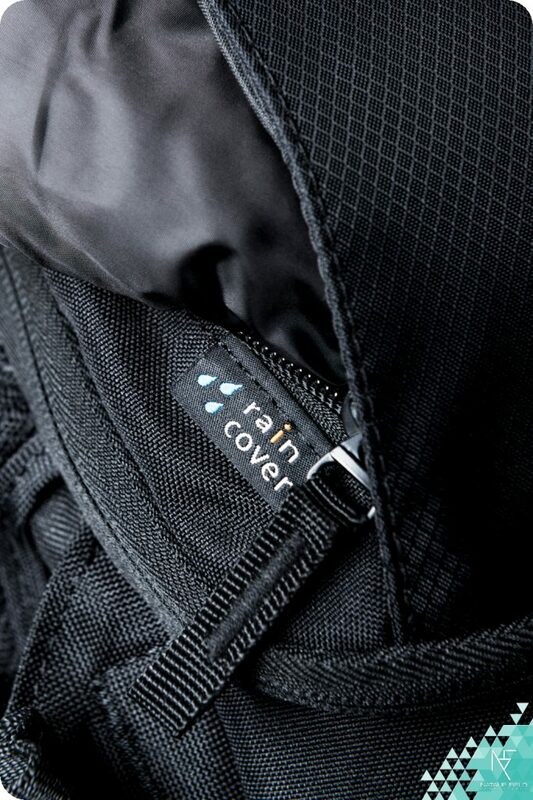 So, I decided to do some research and find a bag that ticked all the right boxes… A small backpack with easy camera access that can carry a tripod and has rain cover. As mentioned, a key factor for me is to travel light when exploring on foot. 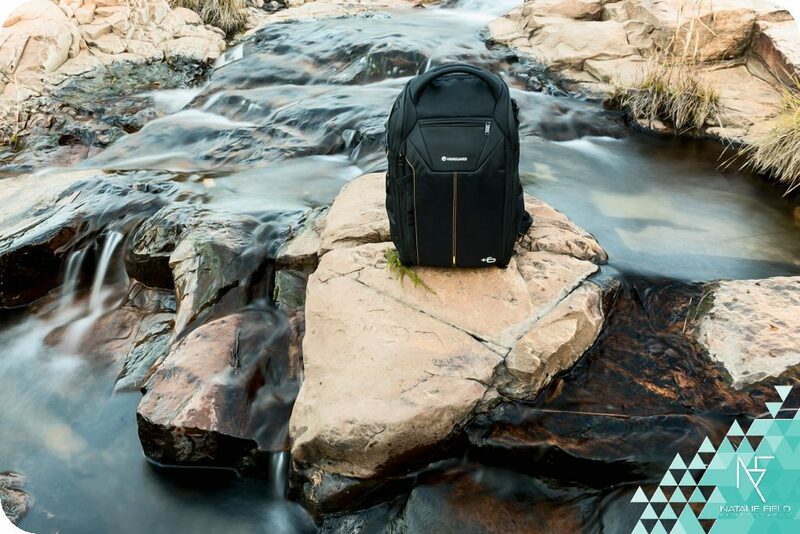 With exterior dimensions of 320x230x490 mm this backpack does not extend past the body, making it easy to fit through narrow spaces, thick foliage or maddening crowds. It also makes it airport friendly, as it falls within the ACSA restrictions of 360x230x560 mm. But is it big enough? The first thing I decided to test was the amount of gear it promises to fit into its 260x190x250mm interior. 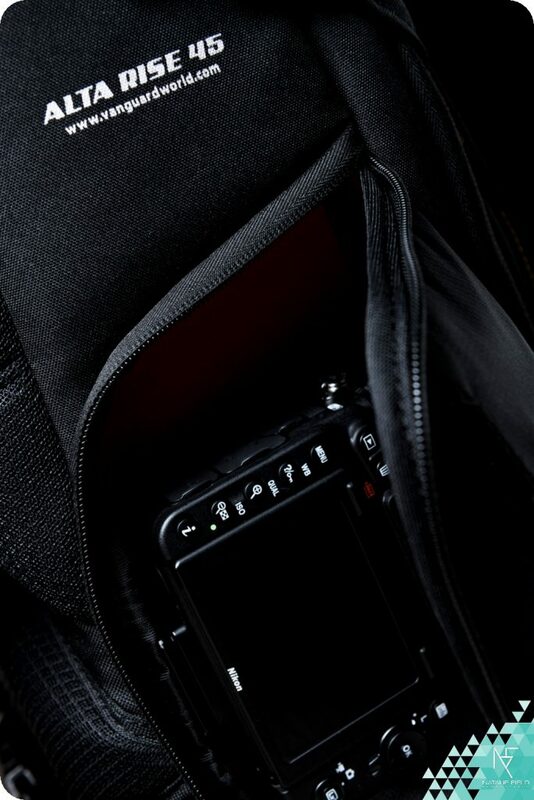 The spec sheet suggests 2x Pro DSLR, 70-200mm lens, 3-4 small lenses, speedlight flash, tablet (up to 9.7”), cell phone, tripod, batteries, memory cards, cables, charger, passport, wallet and snacks! As a pro photographer shooting with the Nikon professional range, I was eager to see whether the gear would fit as advertised. This is indeed doable, although it becomes a bit of a tight squeeze. For example, the speedlight extends somewhat out from the dividers. But this is where the expandable zip comes in handy, adding an additional 6 cm to the bag width to allow space for gear to protrude into. Although one might travel to your destination with the bag this packed, I would personally only take essentials on my day-to-day adventures to keep it light and fun. While one doesn’t always walk with camera in hand, you would like to be able to act fast when opportunity arises. As such, having side access on the Vanguard Alta Rise 45 is one of its best features. Cleverly designed to suit the right-handed majority, swinging the bag off the right shoulder allows the right hand to reach for the quick action pocket and remove it with ease. 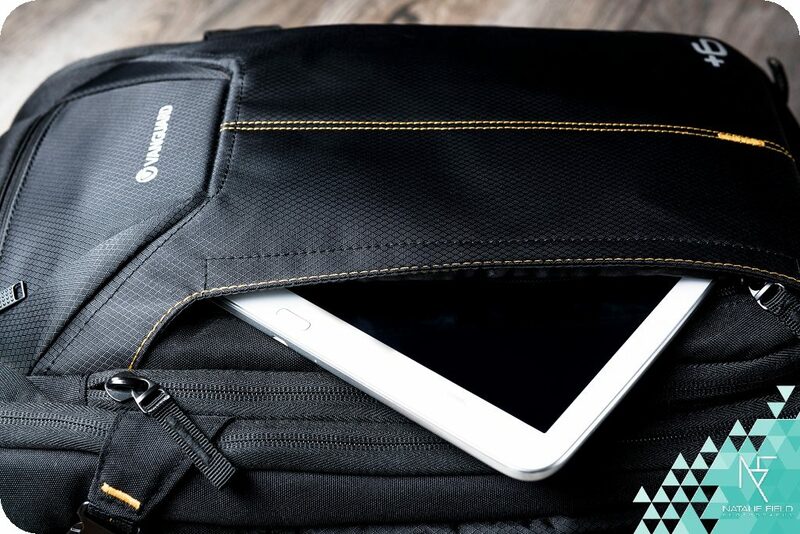 While on the topic of easy access, it is worth mentioning that the tablet is similarly stored in a dedicated pocket with both internal and external access (with a cleverly hidden zip to deter sticky fingers). 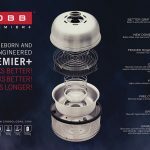 With the functionality of shooting to a smart device becoming more prolific, this easy access storage should come in useful for many. In fact, I myself recently started investigating this technology to capture conceptual self-portraits (more on this soon). 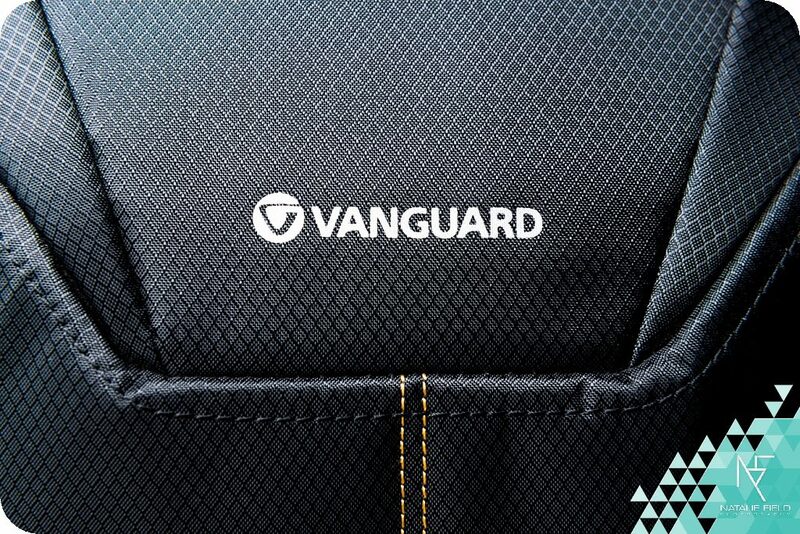 An innovative trend from Vanguard is their storable tripod carrying system, which is stowed neatly within the bag to be rolled out when required. 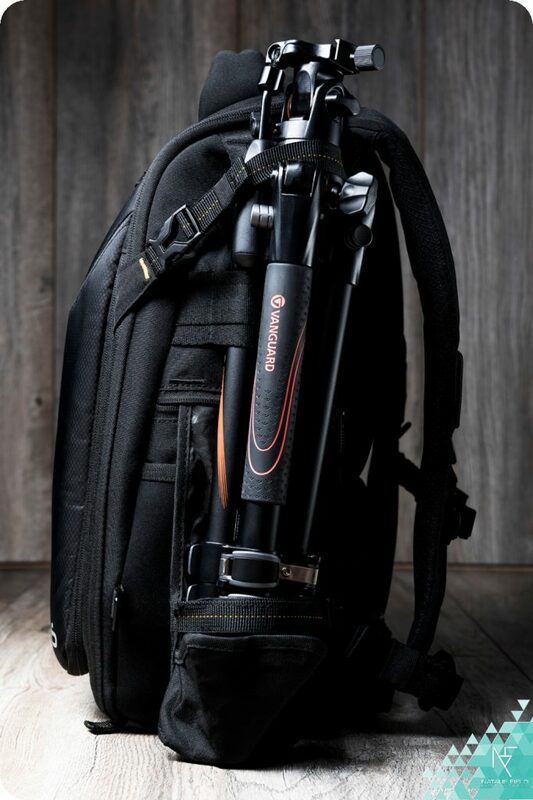 Offering a tripod holder with well-placed clasps for smaller pods, the bag also provides an Alta Link connection to attach the Alta Action tripod bag. My Veo tripod fits perfectly without extending past the bag itself, keeping the compact shape intact. My only criticism here would be that once in use, the tripod covers water bottle pouch. Alternatively, the bag does also feature an easy access top compartment, where one could lay down a water bottle along with snacks. However, I would recommend placing it in a water tight bag to be sure no leakage accidentally ruins the gear lying underneath. I was also concerned that if the zips on this top pouch were opened too far, the actual gear could come tumbling out. But the designers at Vanguard really have thought of everything, placing clasps on the side of the bag to prevent the zips from going down further than required for this compartment. 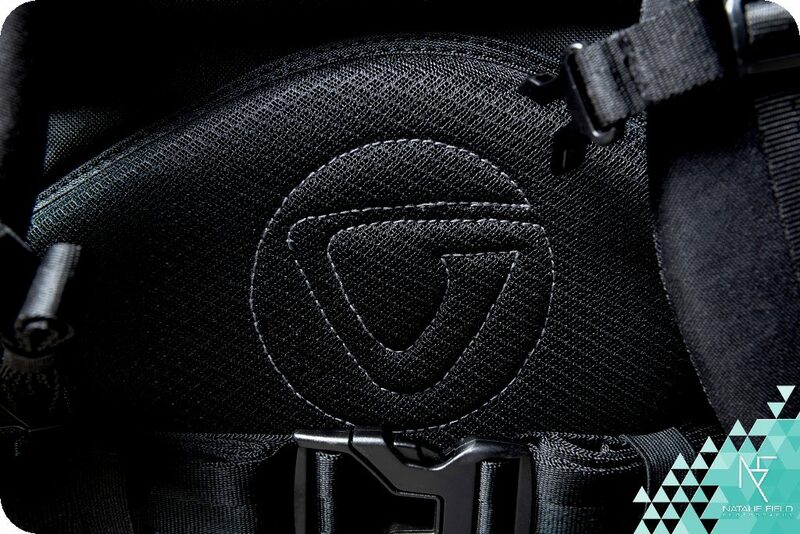 It is little things like these that make it clear that the Vanguard Alta Rise 45 was designed with the user in mind. 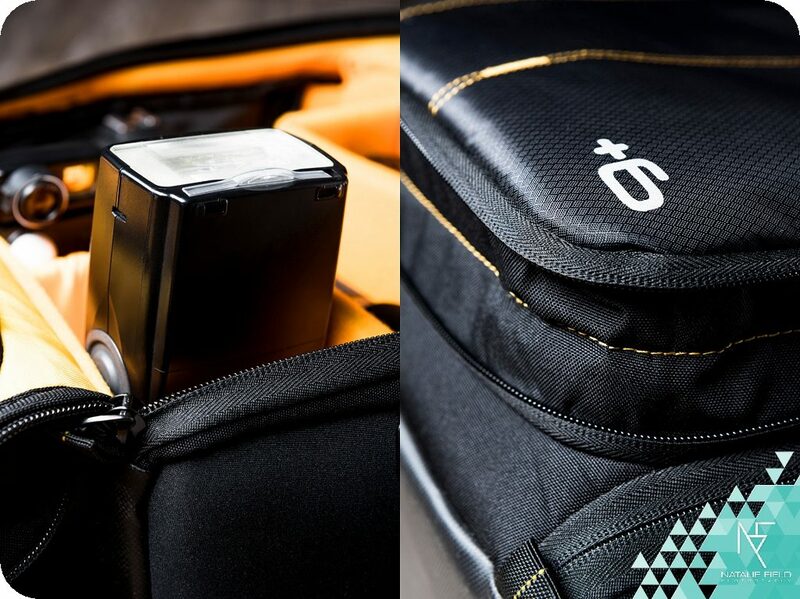 Other pockets and compartments include a safe spot for the wallet/passport on the back of the pack, new and used memory card pockets, as well as storage space for the additional lengths of the harness straps in the air cushioning. The ergonomic air system of breathable back and harness goes some ways to keep you cool while moving around. And I love that the harness connects over both chest and waist to make for a snug fit. Last, but not least, the rain cover. 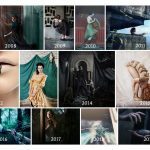 The past two years have seen me hiking through the mountains of Tasmania, creating in the countryside of Finland and shooting commissions in the UK… Trust me, YOU NEED A RAIN COVER! And, like I said, there truly is a bag for every occasion. 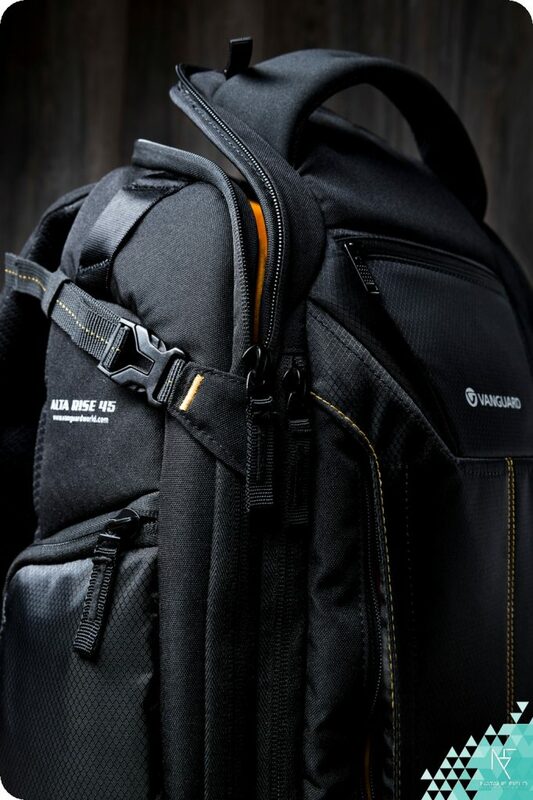 So, if the Vanguard Alta Rise 45 isn’t quite what you are looking for, the Alta range also comes in 3 different sizes of Messenger bag, a Sling bag and larger Backpack to include laptop. You can read more on the Vanguard Alta range here. Special Thanks to Melissa Field for adventuring with me to test run the Vanguard Alta Rise 45! Left: Urban adventure at the MTN 702 Walk the Talk fundraiser in Johannesburg. Right: Landscape expedition during the Star Party the Mountain Sanctuary Park in Magaliesberg, Gauteng.